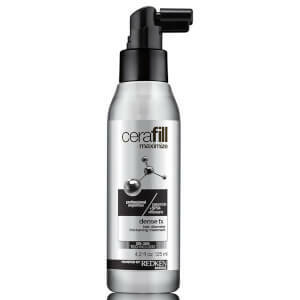 If you find your hair thinning, this Cerafill Retaliate Shampoo and Conditioner by Redken can help you clean, condition and thicken your strands. The Cerafill Retaliate duo contains a shampoo (290ml) and conditioner (245ml) that combine to give you healthier, richer looking hair. 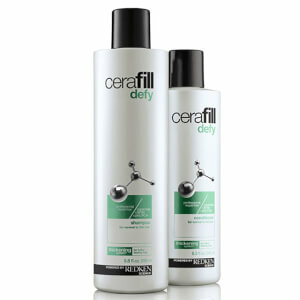 The shampoo comes with a menthol formula that cleanses your hair and thickens it with its innovative Cerafill System Technology. This formula prevents breakages and nourishes your scalp. The shampoo has a ginger mint fragrance. 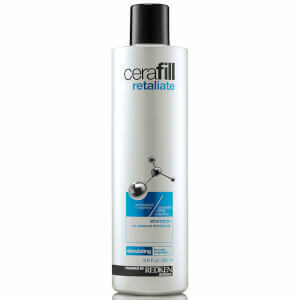 The Cerafill Retaliate Conditioner uses a menthol formula that cools your scalp. It adds body and shine to your hair, while strengthening it to prevent future breakages or split ends. I have androgenic alopecia (female) it made my hair a lot thicker and I don't have as much hair falling out. Also I suffered from greasy hair and it's stopped it! Amazing! Its worth the money and it smells amazing!